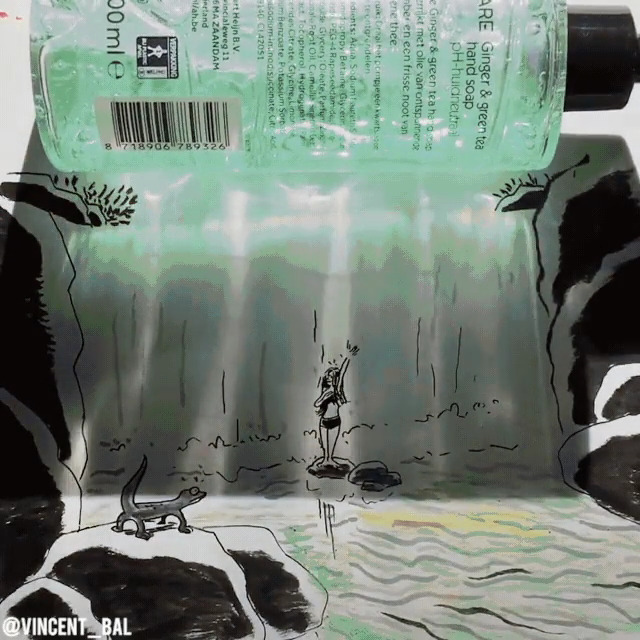 This multimedia style using shadows by filmmaker & artist Vincent Bal blew me away with the creativity involved. He calls his art Shadowology or Shadow Doodles- he takes the shadows of ordinary items and creates whimsical compositions based on them. The GIF above impressed me, and it kept going & going with more amazing examples! My favorites are the ones that simulate water, such as the gel bottle creating a waterfal effect, or the glass of water refracting light into the appearance of a beach at the seashore. The exhibit theme is "Psychedelic" & it coincides with the theatre's production of the play that takes place in the 1960's, "Hair". Last weekend, my family went to Lancaster for a dinner & show at the Rainbow Comedy Club. For the last few Christmases, my parents have given our family tickets to the theater and reservations at the Richmond House bed & breakfast. We always have a great time on the trip, and before heading home, we usually stop at some antique markets in the morning. This year, we went to Shupp's Grove in Adamstown, PA. It's set nicely in a wooded area, and luckily the weather was good. When I go to these places, I am astounded at the amount of random crap on display. There's just tables & tables of STUFF of all kinds. Some of it is valuable antique, most of it is total junk, & much of it is probably open to interpretation. I love to take pictures of the weirder and more humorous items I see at these markets. Since I'm a man of few wants & needs, I rarely see anything I actually want to buy. The one thing I'm a sucker for is books. This time, I did get an American Medical Association: Encyclopedia of Medicine for $1. I always notice monkey-related things for this blog. Last, but not least, "Farm Country Ranch: Action Rodeo Set"
This is a little promo for another blog I created with my soon-to-be wife Loretta, called "Conscious Living for You." We created the brand & the blog as a resource for people who want to lead a healthier lifestyle. In addition to being a creative professional and being interested in spirituality & meditative traditions, I have a science background and love to learn about everything. Loretta is a nurse and a yoga teacher with a strong medical education. Together, we want to introduce concepts and research that supports lifestyle choices that lead to positive results for the mind, body, and spirit. So far we have written about the effects of stress, the benefits of breath control, sugar addiction, yoga, and other topics that are of interest to anyone who wants to improve their state of being. Please follow our blog on Google, or Like or page on Facebook to get our latest posts. Thank you for your support! We hope to bring a healthier way of living to you and all people. Although it has been rainy this week, overall the weather is getting warmer and the Spring weather is causing all the plant life to bloom. I love this time of year and enjoy experiencing nature come back to life. I took the above photo of a flower on my Mom's porch where her feeders attract swarms of hummingbirds. It might seem like a weird question. Our perceptions experience the world as made of matter & energy. However, we now know that there are much more exotic properties to reality at the most basic quantum levels. How does existence organize itself out of the seeming chaos of the quantum field? How is information preserved throughout all levels, to give rise to atomic order, physical form, forces, and all the other systems that keep the Universe running as it does? These are deep questions that compel us to dive head-first into infinity, to try and comprehend the unimaginable complexity that we are immersed in. 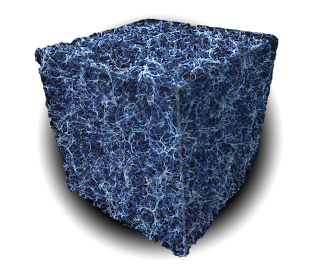 If the Universe is really made of information, then how much can be stored in a given space? According to the article, the maximum limit is 10^69 bits per square meter, and if you tried to pack information more densely than that, it would collapse into a black hole. By "words", he was referring to information- the idea is that by understanding the way in which the Universe processes information, we can use that knowledge to affect it according to our intentions. McKenna also was interested in "novelty" or new phenomena, which the article also discusses as an aspect of information theory. Basically the Universe favors surprises & additive or cumulative information. Nassim Haramein has also been exploring the possibility of unifying our view of physics through the organizational patterns of sacred geometry, and he has proposed the theory that ALL information in the Universe is stored at EVERY point in the field. 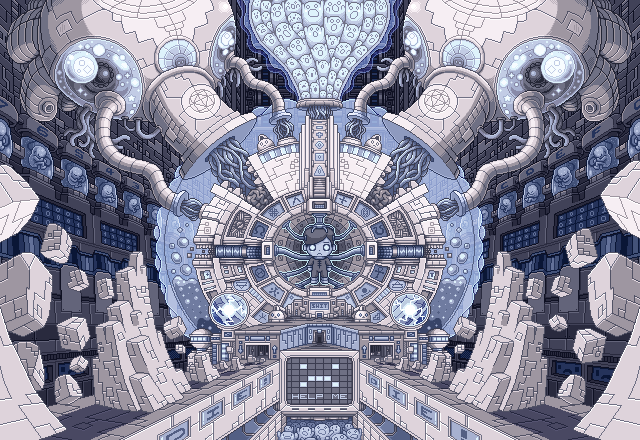 It is a fractal, holographic storage system built into the fabric of reality itself. An Ordering Principle for Living Systems? Ultimately, these are all just labels and primitive attempts at our monkey mind to grasp the infinite expanse & depth of our world. However, by thinking about these things and better understanding this miraculous existence we inhabit, we actually fulfill our purpose. We ARE the Universe itself, learning & cycling back information into a feedback loop that informs every aspect of reality. 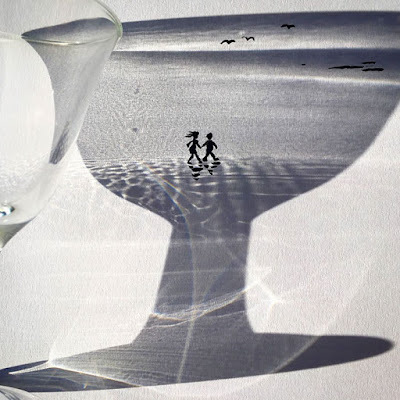 We are at the same time a tiny piece, yet an integral part of the whole. How awesome would a story line in the new movies have been where the main antagonist was an A.I. like this- who could somehow wield the Force, or simulate it? What kind of interesting dynamics could have been explored if there was a dichotomy established between cybernetic intelligence vs. organic life? 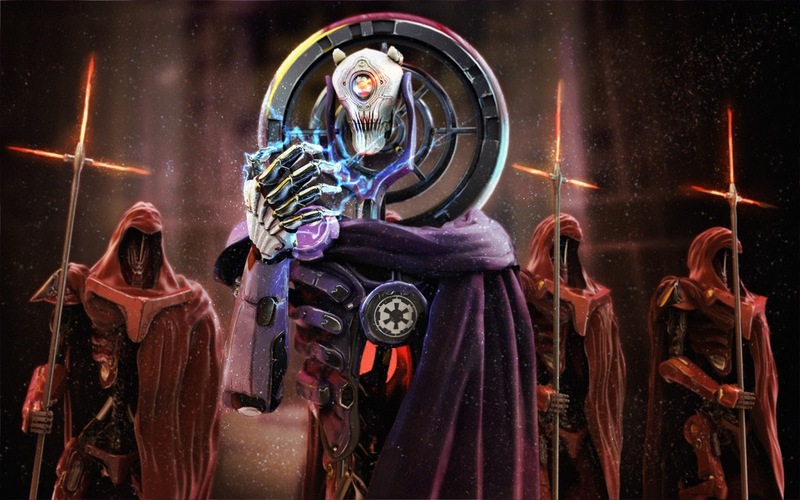 "Some alternate history path lead to the early death of Darth Sidious (possibly at the hands of Mace Windu) before the infamous order 66. Then the separatist suddenly came with a new AI development in superior tactical droids. But something didn't went as plan. And then the AI took over and began the systematically eradication of all organic life in the galaxy. 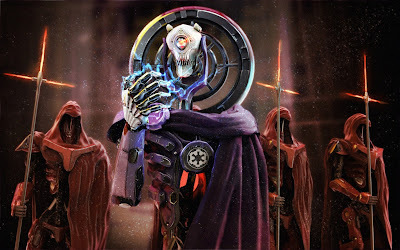 In response the fallen Republic built a response, another type of new AI that could replicate "the force" in synthetic ways. Like manipulation of gravity, magnetism, anti-matter, photon particles, etc." How would a human (or any other sentient, biological species) address the threat coming from a computerized or robotic being that had a cold, calculating decision to destroy all life? Perhaps it isn't even a single being. Maybe there is a hive mind or collective intelligence in which the droid is just a vehicle for a digital cloud consciousness. There are so many mind-bending possibilities, and to some extent some ideas have already been explored in other media, such as Marvel's Ultron storylines, Mass Effect games and many others. The complex relationship between human & machine is always a very relevant topic. So why didn't Star Wars go this route in the new trilogy? I've been waiting to write this post, & thinking about level to which this single illustration intrigued me. So, to be honest, it made me realize just how un-creative the new trilogy has been when you really consider it. This is coming from a lifelong Star Wars fan, who credits these movies with heavily influencing my outlooks & perspectives on many aspects of life. I've written reviews for both The Force Awakens and The Last Jedi, and I truly enjoyed them for what they are. However, they have serious flaws and the stories are pretty unimaginative after seeing how they are unfolding so far. For instance, instead of something compelling like The Droid Emperor, we got Supreme Leader Snoke, whose enigmatic potential was literally cut down unceremoniously by his apprentice Kylo Ren in Episode 8. As I explained before, I understand the attempt to have a contrast between Snoke & Luke's worldly exits, but it seems like there was so much left hanging or completely untouched there. When I got my first glimpses of him in the gold robes, I thought there would be some study of him as the conniving ultra-capitalist or social elitist, with opulent gold or decorative surroundings. It would have been a great contrast to Luke's simple hermetic existence. Which also reminds me of the overall lack of cool aliens in these movies, either new or from existing species. As someone said in a comment thread- There is a casino planet... but no Hutts are around? The crazy, yet familiar aliens are one of the main factors that define Star Wars. They were mostly absent from The Last Jedi. This, and the lack of interesting locations, led to Episode 8 feeling shallow and not very rich in world building. 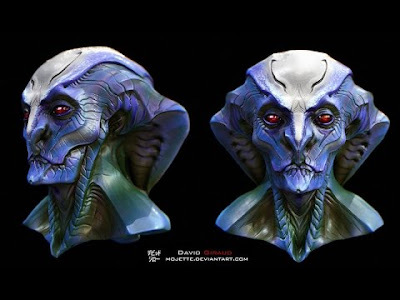 In addition to a more alien Snoke or a robotic villain, what if they drew from the Legends material & had an extra-galactic alien threat like the Yuuzhan Vong that invaded the Republic? ...Nah! Lets just have The Galactic Empire 2.0... I mean, The First Order, somehow running the galaxy again despite being comically inept. Then the Republic reverts back into the Rebellion & we're back where we started in A New Hope. Again, this is all simply a lack of imagination. Probably the best part of The Last Jedi was the revelation of Luke's Force projection power & transcendence into the equivalent of a light body. Unfortunately, there was way less focus on Force training (both light & dark) than I had hoped. There is so much metaphysical depth to be examined, but it seems like The Last Jedi sacrificed this potential for inane side plots and nonsensical space chases. My final complaint is how Luke was handled. I didn't mind that he exiled himself to an island on a remote planet. The fact that it was the location of the first Jedi temple made it interesting. The absurd part is that Luke "cut himself off" from The Force while in exile. This is so dumb. How can you even do that? It's like saying, I cut myself off from the quantum field. Even worse, he proceeds to teach Rey about The Force. Why would he share that knowledge if he didn't want to be connected to it? It would have been much cooler to see Luke as a wise (but still hardened) old master who sought solitude to deepen his connection with the Force and achieve understanding- not act like it doesn't exist! On a more positive note, they did do the right thing by making him win by not actually fighting at all in the final battle, a very Taoist approach to his showdown with his nephew. After seeing the awesome, trippy animation above, I looked into the artist Paul Robertson, who has done animations & graphics for clients like Adult Swim. He uses a pixelated art style and uses old programs & techniques to achieve this look. Despite the outdated methods, the results are a higher dimension of mind-blowing visuals.